Plans to develop the area around the Lake Merritt BART station will affect the very heart of Oakland Chinatown. The Station Area Plan includes housing and development that promises to improve economic outcomes, but in doing so will attract a new demographic of residents. While the project’s Draft Environmental Impact Report (DEIR) argues that population displacement is “not (a) significant” risk, opponents of the plan cite research that concludes otherwise. In fact, redevelopment on the scale of this project has historically resulted in displacement of low-income communities of color and immigrant populations. Chinatowns have been especially susceptible to this phenomenon. Oakland Chinatown is a vibrant low-income immigrant neighborhood. In 2008, the City of Oakland began proposals for the Lake Merritt BART Station Area Plan (LMBSAP), and intends to build a transit-oriented village at the current Lake Merritt station site. The purpose of redevelopment at the site is to connect several adjacent, but very different neighborhoods. Of these service areas, the high-end waterfront condos of Jack London Square and the Warehouse District stand in stark contrast to the bustling enclave of the country’s third largest Chinatown. An ideal development plan for the BART station would benefit both communities equally, supporting economic growth and expansion of service without changing the character of the Chinatown community. Current development plans for the project area, officially called the “plan area,” threaten to displace Chinatown residents. The complex vulnerabilities of the Oakland Chinatown community include an active ethnic enclave economy, low-income residents, seniors and children, and an intangible cultural heritage. Each of these groups could be negatively impacted by the LMBSAP and the proposed alternatives in the Draft Environmental Impact Report (DEIR). The impact of revitalization projects on ethnic economic enclaves has been well documented in academic research and throughout media sources. Using peer reviewed research, case analysis, and urban economic models; I collected data on both qualitative and quantitative processes. Quantitative data that precedes this report was used to measure and compare against the information gathered in the field. 4030, 4031, 4032/9832, and 4033. These tracts extend beyond the neighborhood boundaries of Chinatown but best capture the extent of the enclave as an economic and ethnic sector of Oakland. These data were mapped to produce a clear enclave delineation of the high-concentration areas this report aims to analyze for vulnerability to displacement. Qualitative data was acquired through field notes and contact with key groups of residents and community leaders. A small sample of residents (less than 5) in Oakland Chinatown were interviewed using a prepared questionnaire in which subjects were asked specific questions about development projects, consumer behaviors, local preferences, and concerns about their neighborhood. In addition to collecting data about displacement risk and anticipation from interviewees, surveys included questions about cultural values, heritage, and sense of place. The fieldwork aspect is an essential part of this study because it provides access to real people, observable culture, and community preference in the district being scrutinized. Because the community I collected data for is typically (speaking only Cantonese or Mandarin), translation was sought and provided from APEN and other community members. Through these contacts and this process, the cultural experience of residents before, during, and after development projects in their neighborhoods was determined for analysis. This report utilized three case studies to measure the impact of transit-oriented development (TOD) projects on displacement. Two specific locations with cross-comparative likenesses to Oakland Chinatown were analyzed in addition to Oakland Chinatown and the Lake Merritt BART Station Area Plan, which is analyzed in the third case study. Using specific criteria (identified in Part II. Case Studies) to determine outcome success or failure, these studies include TOD projects in low-income, and low-income ethnic communities that have either undergone or are currently anticipating major development projects within their vicinities. 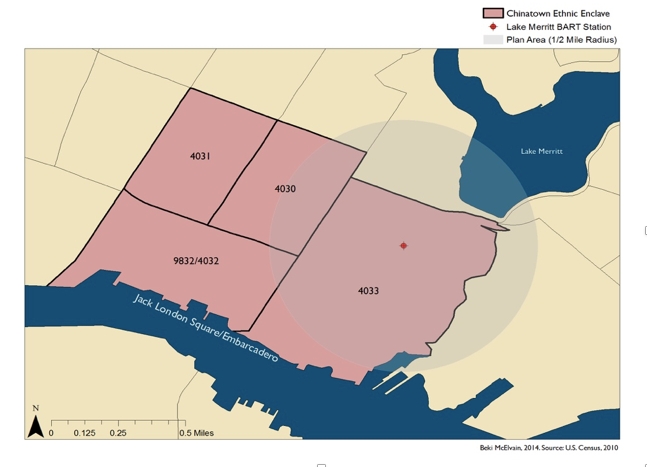 The criteria used to select these sites were racial composition, median household income, and presence of a development at or around a public transportation hub. The Central District Urban Renewal Plan (1969) was implemented in what is now called Old Oakland, adjacent to Oakland Chinatown, consisted of office and retail space accessible to transit, and is the site of the largest redevelopment project ever undertaken in the city’s downtown area. The Fruitvale Transit Village Project () is a TOD project at the BART station that serves the Latino ethnic enclave of Fruitvale, and consists of largely retail and residential development accessible to transit. The Lake Merritt BART Station Area Plan (2014) is a large scale TOD consisting of mixed-use retail, residential, and retail development. This Plan is currently under environmental review and stands to impact the Oakland Chinatown community, which makes up the major portion of residents living within the Plan area. Analysis includes housing outcomes, for which United States Census data is used to measure success or failure of a project to retain residents, avoid displacement, and promote economic growth without disturbing the cultural vitality of the original communities there. Much of the data required for years preceding the year 2000 was retrieved from the archival website National Historical Geographic Information System (NHGIS), a free source of aggregate U.S. Census and GIS spatial data. Analysis relies heavily on historical information, but also accounts for community involvement during the entire development process in each case study area, noting where public outreach was robust or poor, and taking the nature of the public’s relationship with the project into consideration when assessing outcomes. In 1850, the first ethnic Chinese began to settle in San Francisco. Driven by a combination of housing discrimination and agglomeration of industry, immigrants settled in and around what is now the city’s financial district. There, they primarily opened and operated laundries and employed family members and other immigrants from within that community. Because of this localized labor market, demand for food and housing grew around this cluster of firms, and restaurants, shops, and entertainment venues were established as the community of ethnic Chinese grew and developed into the largest Chinatown in the country. Oakland Chinatown was relocated several times before reaching its final location as an exclusion zone, where it exists to this day. Studies show that low-income communities of color in the United States, which includes immigrant enclaves, are disproportionally at risk for displacement and other negative impacts by a large margin, and a considerable portion of the Chinese contingent in California is considered low to middle income. Gentrification is an externality of redevelopment and so-called urban renewal projects. It describes a process of outside influence in the form of typically white, young, middle-to-upper-class newcomers into an otherwise low-income community, which can lead to displacement of the original residents. The presence of these outsiders has an impact on property taxes and rents as an area becomes desirable to a more upwardly mobile demographic, frequently causing original residents to be priced out of their own neighborhoods. Newcomers, who are often unconsciously implicit in the displacement process are therefore at the forefront of a much larger economic disparity. Average incomes increase and communities change drastically as original residents are displaced. Economic growth of this kind is great for those who can afford to enjoy the positive externalities of neighborhood change. This growth frequently comes at the expense of the existing culture of a place. The negative externalities of change take their toll on culture – or more accurately, on intangible heritage – and are a devastating side effect of community displacement that puts those niche economic systems at risk of dispersal. Based on assumptions about race, class, and economic behavior, there are arguments that gentrification isn’t the adverse occurrence many believe it to be. It is true that there are positive externalities to gentrification, but these findings don’t always take into account the limited social mobility experienced by individuals living in low-income communities of color or ethnic enclaves, nor do they include the issue of displaced individuals and families. In Oakland Chinatown, it is precisely the poor, disabled, and elderly population that is most at risk, and the possibility of rapid economic change could have devastating impact on the people and local economy. An ethnic enclave relies on economies of scale (density and co-ethnic demand) for balance, and the introduction of other preferences combined with the exodus of any percentage of residents could tip the scale on labor, resources, and the entire local market. An economic enclave needs density to exist, and anything that threatens that density should be considered a negative impact. Families and low-income people – disproportionately people of color and immigrants – are being dislocated from their communities either directly through legislation like the Ellis Act, or indirectly as their communities change and grow, both economically and in population. The greater social costs of gentrification are complex and varied. There are economic and cultural resources specific to low-income immigrant communities that are particularly susceptible to displacement through development. Investment in development around transit is a rising trend in the development sector. The positive outcomes of transit oriented development, or TOD, are numerous. From the environmental to the economic, focusing controlled development around transit access can produce hubs that support jobs, commerce, and healthy lifestyles. There are negative externalities to TOD, however. Local government and community interest in developing transportation infrastructure is a key indicator of pre-gentrification. As a rule, more access to housing and consumer centers has an increasing effect on population. In already densely packed low-income areas, transportation investments may provide immediate access benefits to proximal existing communities, but often conversely open areas up to drastic neighborhood change as places become more accessible to outside influence. New renters and homebuyers in urban areas value public transit. This is the defining benefit of TOD. Transit-accessible low-income areas essentially provide affordable housing for the middle-class and first time homebuyers, which makes gentrification inevitable as young people and middle-income earners flock to urban environments. Environmental concerns and a paradigm shift in work mentality makes commuting unappealing and the suburban sprawl famous in post-war 1950s less desirable to the middle-earner demographic, who have a vested interest in lowering fossil fuel consumption as well as individual transportation costs. People want healthy, accessible neighborhoods, but this can come at a cost to existing low-income residents. Displacement in a gentrifying community can be identified by taking data snapshots of a particular geography over time and calculating any decrease in a low-income minority population over time, noting any increases in population of an outside, typically non-minority group. While this is enough to show neighborhood change, extrapolating causation and correlation is more complicated. This report identifies five key indicators of community susceptibility to displacement because of TOD projects. These are to be considered with those snapshots both in Oakland Chinatown and in the related case studies. Ethnic enclaves are highly vulnerable to displacement. Ethnic communities develop around firms that meet their unique preferences. Because firms themselves tend to cluster around intermediate inputs and each other, these preferences drive the density and co-ethnicity of ethnic economic enclaves (Chinatowns are a notable example of this pattern). The pattern is reinforced where members of an ethnic group are less socially mobile; they tend to be more spatially confined. This confinement creates protected markets in which co-ethnic commerce takes place. Ethnic economies as they exist in urban enclaves are able to do so only under very specific conditions. The most important of these conditions is co-ethnicity in employment, which occurs when a firm employs workers of the same ethnicity as the employer. This arrangement supports a community of people with shared heritage who work and live within the same enclave, a shared labor pool and the sharing of intermediate inputs. This is coupled with sectoral specialization, or goods that are typical of an enclave and inherent to the market within that enclave. Low-income and elderly residents in a neighborhood are disproportionately susceptible to displacement. Often, residents are both, being poor and senior citizens. Further, because many residents are foreign-born, or worked their whole lives in the U.S. for cash wages (outside of the FICA system), they often have no Social Security benefits to retire on. For these reasons, lower incomes are common in populations over 65 in ethnic economic enclaves. Those who are living in affordable housing might be protected by certain eviction clauses, but residents on fixed incomes stand to see the amenities they rely on replaced by higher-end businesses as their neighborhood experiences economic growth. Crime and blight might be reduced, but services and groceries could become unaffordable. Another indicator of susceptibility to displacement is the level of education a demographic group has achieved. Often, language and income limitations negatively impact the ability of immigrant groups to attend or complete school. Subsequently, lower educational attainment hinders social mobility outside of the core group – especially for those who spend their lives in co-ethnic enclaves. Because of this, displacement from an enclave can be more severely detrimental for a monolingual immigrant with little or no formal education than for a person who is able to communicate in English or is more educated. One of the best-understood indicators of neighborhood change is rentership. This rate of purchase and preference is often the first thing to change with other aspects of a neighborhood. The premise is simple: When economic growth occurs, various other functions of that growth (crime, access, schools, etc.) make an area more desirable in which to live. This perpetuates investment in the neighborhood, often in the form of better or upgraded housing options. What follows is an influx of renters able to pay more, which rapidly raises the average rent in an area exponentially, until at some point, the housing stock is only affordable to those willing to pay more. Displacement risk is especially high for residents who spend 30% or more of their income on housing. Renters in this category typically don’t have as many options as higher income earners, and could be forced to leave a changing neighborhood completely if evicted or otherwise displaced. Cultural sustainability is what I call an “invisible indicator.” A community’s culture often exists in the form of intangible heritage – like language, shared history, religion, festivals, and collective memory – and can be hard to measure. Still, cultural heritage is an intrinsic factor of community susceptibility to displacement. Ethnic economic enclaves are bonded by heritage – both tangible and intangible – and become vulnerable when shared cultural values are threatened by outside preferences. Ethnic communities in the U.S. sprang from foreign cities, towns, and villages with resource-based economies that are defined by centuries of cultural normativity. Many of these economies, both in local enclaves and among groups abroad, have experienced a shift toward tourism-based economies because of fetishization of “exotic” or “foreign” goods, which results in an enclave’s heritage being commodified at the expense of authentic culture. Tourism, while a significant revenue generator, often appears to celebrate culture and tradition by opening an enclave to the outside world. But tourism is less protective of culture than it is destructive when it replaces an economy based on shared heritage with an economy that sells heritage. This points to specific vulnerability for each case study, and will be measured using different indicator examples in each one. In the full-length version of this report, three case studies were analyzed for susceptibility to displacement based on these indicators. The case studies include Oakland Chinatown, which is the focus of this report, as well as two geographically and socio-economically comparable study areas: Oakland City Center and the Fruitvale Transit Village. Summaries for those comparable study areas can be found in the following sections, followed by the full-length study of Oakland Chinatown. The City Center project displaced many people during is initial phase, and created unprecedented commercial space in an otherwise low-income residential area. The application of office and retail space had a considerable impact on the population density of the area, making City Center and Old Oakland unique among the case studies in this report in that there weren’t very many people living within the study area after project was implemented until relatively recently. In this case, community involvement was more reactive and less collaborative from the beginning stages of the project. Organization could have included existing businesses, supportive residents, and called upon neighborhood leaders, rather than simply razing those blocks and destroying an historic district at the core of Oakland’s downtown. While it is possible a community-driven approach was not an available option because there was not a contingent ethnic enclave in the area at the time of the project implementation, the project could have benefitted from a higher level of community involvement. Ethnic enclaves tend to organize more readily and have a larger stake in the well-being health of their neighborhoods. Still, the “urban renewal” so popular during this time period has been criticized as nothing more than slum clearing and a tool for heavy handed and calculated gentrification of blighted inner-city areas. The income and racial characteristic data for the study area suggests that residents displaced by both the initial and the continued development of downtown Oakland likely relocated to a different low-income area due to a lack of other viable options. According to the perceived spending power of the average resident living in the plan area in the late 1960s and early 1970s, there would have been few housing options outside of other low-income housing in other areas. This indicator implies a dislocation effect that simply moves one poor community to another, and suggests a strong need for affordable housing in the immediate viscinity of downtown. The low-income, rent burdened, minority community of Fruitvale is considered susceptible to displacement. Nonetheless, the construction of a Transit-Oriented Development in the heart of the neighborhood did not result in displacement, and the community was able to derive added benefits from the development in their area. With the help of the Unity Council, the residents of Fruitvale responded directly to the issues that threatened to displace them when the project was first proposed in the early 1990s. They took action and worked together to change the project’s goals, and even advocated for a community-focused anchor tenant for the plan site, eventually successfully securing La Clinica de la Raza. The decision to establish the Fruitvale Business Improvement District (FBID) contributed greatly to the success of the model. The FBID provides the framework necessary to sustain the positive elements of the final project and a continuous community voice for new revitalization goals in the neighborhood. Because of this collective influence, and because the final Fruitvale Transit Village project incorporated the needs of the Fruitvale community, this report finds the project to be a strong model for successful TOD. The purpose of this case study is to evaluate the potential impact of the Lake Merritt BART Station Area Plan on the surrounding community, most of which is home to a majority population of Chinese and Asian immigrants. Using the indicators and the outcomes of the prior two case studies, Old Oakland and Fruitvale, this report will assess the susceptibility of Oakland Chinatown’s residents to displacement and provide recommendations to mitigate that vulnerability in Part III of this report. The racial composition has changed over time in Oakland Chinatown, but while there has been a small influx of other Asian ethnicities, particularly over the 1990s, Chinese people remain the dominant population within the enclave, and continue to grow in number. The culture of Chinatown with still overwhelmingly Chinese, but there are more instances of co-ethnically owned and operated restaurants and other businesses that represent a distinctly separate Asian presence in the enclave. Perhaps this is also due to the “family-chain-network” characteristic of immigration so common or Chinese people, who tend to move to where relatives and existing social groups are already located. The Chinese immigrant community is clustered around firms that supply goods and services specific to the preferences of the people there. Conversely, the enclave itself provided a shared labor pool in the form of firm owners’ family members and other co-ethnic workers from the community. Few left the enclave unless it was to engage is trade or commerce specifically targeting outside patrons. From Oakland Chinatown’s early days, grocery suppliers, shrimpers, and laundrymen provided supplies for locally owned and operated restaurants and households, and, in turn patronized the same restaurants and went home to residences within the community in a supply and demand cycle typical of ethnic economic enclaves. Today, a majority of people living in the enclave walks to work or use some form of public transportation or taxi if they do not work from home. Of these, 11% are business owners or managers. In fact, management makes up 41% of the occupations held by residents living within the enclave, which could refer to any number of retail, professional, or restaurant ventures in Chinatown. Another 10% make up professional workers (non-management), most of who are teachers or computational service employees working in educational fields. Food preparation makes up another 10% of occupations within the enclave, which may include groceries, restaurants, and other food services. Nearly 11% provide health and personal care services, and 16% provide office and sales services. Of the ethnic Chinese people living in the same area, 49% work in these fields within the enclave itself, traveling less than 1 mile either on foot or by public transportation to get to work. Informal interviews and field observations showed that the majority of residents purchased goods and services within the boundary of the enclave, participating in the market as both suppliers and consumers on the same block. For example, the woman who works as a hairdresser will purchase groceries at a produce supplier walking distance from her shop, and later may participate in tai chi (exercise) with a contingent of other community members in Lincoln Park. In turn, the man who owns the laundry might have his hair cut at her shop, and both the grocer and the hairdresser patronize his store. For the mostly monolingual residents, there is a comfort in clustering. Patrons are likely to all speak the same language and possess the same collective memory and heritage. This combination of quantitative and anecdotal data shows a possible correlation between the needs of the market and the geographical location of those businesses. Because many of the people living in Oakland Chinatown are considered low-income residents, the balance of cost and supply remain very important. It is density that solidifies a sense of community identity in ethnic districts, and density that designates the marketplace. The present population to land area ratio in Oakland Chinatown comes to around 8226 (). This has increased from the past thirty years, and has changed with the demographic makeup of the community as more Asian ethnicities have found a home in the enclave, and an increasing number of young people look to Oakland for their housing needs. Oakland Chinatown is home to nearly 5,000 residents of Asian descent. Of the ethnic Chinese residents, who make up 62% of the mostly Asian population in Chinatown, 8.8% are children under 14 years old, and 27.8% are residents over the age of 65. A substantial 31.3% of the total neighborhood population consists of people living at or below the poverty threshold. It will come as no surprise that much of the rental stock in Oakland Chinatown is designated senior housing. Major housing structures for seniors are located throughout the Webster St., Franklin St., and Harrison St. corridors, and centers like Hong Fook and Asian Health Services (AHS) provide necessary services and transportation to neighboring facilities. Very few of the elderly in Chinatown drive, and prefer to walk or rely on family members to transport them instead. Monolingualism, while typical of ethnic enclaves, can serve as a major setback for individuals who wish to participate in the greater labor market. Assimilation is hindered most by many Chinese immigrants’ inability to speak English, which in itself inhibits work outcomes outside of the enclave more than any other factor. In Oakland Chinatown, 63.6% of residents are monolingual, speaking only Cantonese or Mandarin dialects of Chinese. Similarly, education plays a role in the success of immigrants who venture outside of the enclave to work. Those individuals with a higher level of education tend to find work at a higher rate of pay, and to move from the working class to the professional class more easily. In Oakland Chinatown, 17% of residents have not completed the 9th grade, 11% made it to 12th but didn’t graduate, and only 14% obtained bachelor’s degrees. This is not surprising for an ethnic enclave of immigrants, as many were originally farmers or tradesmen before immigrating. In Oakland Chinatown, only 28.4% of housing units are owner occupied, compared to the 71.6% of homes occupied by renters in the enclave, in which tenants are more susceptible to eviction regulations (U.S. Census Bureau, 2010). Displacement risk is high in Oakland Chinatown, where an estimated near half of the population is burdened by a rate of rent at or exceeding 35% of median household income. This estimate is in line with housing market trends throughout the region, and especially reflects the rapid rate of unaffordability in the Bay Area. Based on a 1980 data snapshot, rent burden has gone up for Oakland Chinatown residents, presumably with the market rate of housing. There is a slight dip in the percentage of rent-burdened households in 2000, from 36% to 34% of households. The rise in 1990 from 27% to 36% could be explained by the development of adjacent Jack London Square, where market-rate and luxury condominiums have been become common for the area since that time. Jack London Square was included in the study area for Chinatown because of its proximity to the enclave and the high (now lower) population of Chinese and other Asian immigrants living within the tract over the past 30 years. Among the diaspora in U.S. Chinatowns, cultural heritage is a casualty of development. Once persecuted and made to live in ghettos in squalid conditions, Chinese immigrant communities now experience a sort of celebration of their culture. U.S. Chinatowns generate a substantial portion of income from tourism, and much of this is the result of a deliberate effort to generate revenue for whole cities. Like the old villages in China, resource based economies in the largest enclaves have been replaced with tourist economies, in which old traditions have been replaced with new ones that literally capitalize on heritage. The most precious cultural values are now shared among the co-ethnic community, while shops, shows, and festivals are greatly exaggerated version of true heritage, and draw crowds from outside the enclave to spend and invest in the community. As Oakland begins to take on more of the overflow from the exploding population in San Francisco’s constrained forty-nine square miles, development sites in the downtown area become likely spots for economic growth. The area is transit adjacent, affordable, and close to commute routes. These are elements of positive change, but also of urbanization – which has had a negative impact on heritage both in less-developed countries and in low-income areas at home. The Oakland Chinatown area is highly vulnerable to displacement. The income, age, language, and cultural heritage indicators especially are evidence of this vulnerability. Any transit-oriented development in the proximity of the enclave could immediately displace residents forced to move, or displace them over a longer term by attracting a different demographic to the enclave to live in housing adjacent or walking distance to the BART station. Rapid economic change could dissipate the tightly woven ethnic enclave economy of the neighborhood to, where gentrification could price out the people who live there. The ethnic enclave of Oakland Chinatown and the Lake Merritt BART Station area do need to be revitalized to promote economic growth, reduce crime, and provide a better quality of living to the existing community. A large portion of Oakland Chinatown is low-income. While the case study showed that this is largely tied to educational attainment, monolingualism, and the prevalence of seniors, revitalization of the neighborhood could have a positive effect and improve these outcomes if development is appropriately targeted to the existing community. The Lake Merritt BART Station Area Plan proposes to increase modes of non-automobile travel, increase housing stock, increase jobs, provide services, and “support the cultural and demographic diversity of existing businesses and residents.” The goal of the project is to generate interest in new public projects and economic development in Oakland around TOD. I spoke with a long-time resident of Oakland Chinatown, an elderly man named Haibo Pan, and his wife, who I know only as “Mrs. Pan,” in an effort to understand their needs and concerns about the neighborhood changing. In a formal interview and with the help of a translator, Mr. and Mrs. Pan shed light on the needs of Chinatown residents. Of the many topics covered, some major themes stood out: culture, crime, traffic, and other environmental concerns. Mr. and Mrs. Pan moved to Oakland from China, and have lived in Oakland Chinatown for 25 years. They’ve both worked in restaurants just after immigrating, and have held trade jobs since then, although they’re now retired. Mr. Pan worked as a mechanic and Mrs. Pan worked as a seamstress, a job she enjoyed very much. The Pans, typical residents of Oakland Chinatown, have seen the area change and grow, and have an interest in keeping the neighborhood accessible to older Chinese immigrants like themselves. Their community, their safety, and the public space around the BART station is important to them, and they rely on the space to remain consistent in order to meet their needs. They expressed that any changes to this access would be devastating. The Pans, like many of their neighbors, depend on this open space to congregate. The Pans are representative of a larger community voice. The City Center case showed an inequitable planning process in which development didn’t consider the needs of existing residents or account for gentrification trends. Conversely, the LMBSAP seems to have taken the needs of the community into its scope, but there are still risks closely tied to the market and housing trends that dominate the San Francisco bay Area. The Fruitvale case study shows a development that works to bring economic growth to the existing community, while also allowing for expansion and absorption of middle-class homeowners looking to purchase or rent affordable housing. The LMBSAP will be far more equitable if it incorporates the key points of this model. Specifically, this report suggests three key alternatives not intended to function on their own, but with the LMBSAP. These alternatives are 1. Affordable/senior housing at the plan site; 2. A Business Improvement District (BID); 3. A community-focused anchor tenant at the station development site. The prevalence of senior residents in the Oakland Chinatown enclave calls for appropriate housing consideration as a part of any development. Because seniors make up such a large portion of residents, it is important to accommodate that population at that plan site. The actual cost of adding affordable senior housing to the development site is unknown. However, shifting the target demographic for new housing development should not increase costs to the plan. Senior, low-income residents will benefit directly from this addition to the project, which will allow many to upgrade to newer housing adjacent to transit. The Fruitvale case study showed numerous effective and equitable outcomes that supported the goals of both the developers and the community as the Fruitvale Transit Village was implemented. One successful element developed by the Unity Council in the last stages of the Fruitvale Transit Village’s implementation was the establishment of the Fruitvale Business Improvement District (FBID). The FBID comes at a cost to business owners in the community, who are levied a tax based on a percentage of annual property tax assessment. This levy is pooled and then dedicated to the revitalization of the immediate neighborhood. Oakland Chinatown residents that were interviewed for this report expressed an interest in improved amenities, cleaner public spaces, and lowered crime – all of which are likely and feasible outcomes of BIDs based on successful models like Fruitvale. Business owners and residents will reap the most benefit from a BID. Taxes assessed for a BID will provide funds for revitalization, marketing, streetscape improvements, enhanced security, and an overall better-quality environment based on community needs. As outlined in the Fruitvale case study, there were many driving factors behind the success of the Fruitvale Transit Village. The decision to build the mixed-use retail and residential development with La Clinica de la Raza as the anchor tenant was one of the major contributors. Chinatown could conceivably produce the same positive outcome by naming a community-focused tenant to lease anchor space in the mixed-use development at the Lake Merritt BART Station development site. Asian Health Services (AHS) is a local health and advocacy organization that serves over 24,000 patients, 90% of whom do not speak English. Because of the organization’s service and dedication to the Oakland Chinatown community since 1974, AHS could more successfully serve the community from an upgraded and more transit accessible location. AHS will be a good fit, however, any tenant that serves the community in the capacity that AHS does could serve as a successful anchor in the mixed-use development at the Lake Merritt BART Station and deserves consideration. The presented alternatives each have costs and benefits to the community, and each has evaluated for equity, efficiency, feasibility, and effectiveness. An equitable alternative project will ensure community involvement and mitigate displacement of Oakland Chinatown residents. An efficient alternative project will come at the lowest cost to the existing community members and local businesses. A feasible alternative project will be implemented without excessive political or financial barriers to implementation. An effective alternative will encourage economic growth and development that meets the needs of the Chinatown community. On a scale of 1.0 – 5.0, these are ranked according to the above criteria, where a score of ‘5.0’ most meets the requirements of the criterion, and a score of ‘1.0’ least meets the requirements of the criterion. Figure 2. Weighted Alternatives Matrix. The Oakland Chinatown community was established both as a result of and in spite of racial discrimination of Chinese immigrants. Although the community was originally built on the marginalization of Chinese immigrants, the neighborhood has grown to become a vibrant ethnic enclave of festivals, local commerce, and shared heritage. Because of the community’s history, it is necessary to incorporate community needs and ideas into any development goals. Ultimately, this report strives to answer the question, “How can redevelopment in Oakland Chinatown provide economic growth and revitalization and still preserve the homes, economic vitality, and cultural heritage of the immigrant community there?” Each of the proposed alternatives to the current LMBSAP supports inclusionary planning that will benefit the existing community, but the broader policy goal is to incorporate inclusionary policy into Oakland’s planning processes so that low-income and immigrant communities are at the forefront of the development process rather than casualties of it. Because of the case study results and the goals set forth in this report, I recommend two of the proposed alternatives as effective, equitable, and feasible. These are best suited to accompany the LMBSAP, which scores low on the matrix in its anticipated form. First, the LMBSAP should be accompanied by implementation of the Oakland Chinatown Business Improvement District (OCBID), which scored a ‘4.5’ in equity and a ‘5.0’ in effectiveness in the weighted alternatives matrix. The Oakland Chinatown community, like the Latino community in Fruitvale, is made up of resilient, entrepreneurial people. The OCBID will grant necessary autonomy to neighborhood leaders and allow business owners to invest in their community directly. The OCBID will prevent outright gentrification of the neighborhood while supporting economic growth. Second, the LMBSAP should incorporate affordable housing targeted to seniors, an alternative that scored a ‘4.0’ in equity and a ‘3.5’ in effectiveness in the weighted alternatives matrix. If developed in tandem with market-rate housing, the community will be able to accommodate its substantial low-income senior population and simultaneously invest in the vibrant Oakland Chinatown neighborhood. The final proposed alternative, which suggests securing a community-focused anchor tenant (such as Asian Health Services) to lease a main portion of the plan space, is the least feasible of the three. While I believe that the presence of La Clinica de la Raza at the anchor spot in the Fruitvale Transit Village has been both symbolic and effective in mitigating displacement, the costs of accommodating a large, local service organization at the plan site aren’t readily determinable. This option deserves scrutiny as a viable alternative to accompany the LMBSAP, and I emphatically suggest more research on the feasibility of implementing a community-focused anchor tenant at the plan site. Development should be inclusionary and beneficial to existing populations. The status quo fails to meet either of these goals, and does not meet any of the equity criteria offered in this report. The LMBSAP in its current form will be extremely detrimental to the community of Oakland Chinatown unless it is enhanced to accommodate the specific needs of the neighborhood. The recommended alternatives are an avenue to achieve positive results for the neighborhood. A community-based project could provide an opportunity for the LMBSAP to model equitable planning on a regional scale. In the San Francisco Bay Area, where income and race are often directly proportionate to geography and quality of life, the impact of a large-scale collaborative project that mitigates displacement would not be a small one. Beki McElvain received her BA in Public Policy from Mills College. Her work has ranged widely from local planning and rural water infrastructure issues to cultural sustainability research in South China’s disappearing villages. Beki’s most pressing professional interests are equitable economic development; specifically culture commodification and displacement through heritage tourism and arts districting in vulnerable communities. Beki is currently a second year graduate student at UC Berkeley in the Department of City and Regional Planning. Bay Area Rapid Transit, or BART, provides transportation access by heavy rail in the San Francisco Bay Area (www.bart.gov). Abrahamson, M. (2006). Urban Enclaves: Identity and Place in the World (2nd Edition ed.). New York, New York: Worth Publishers. Liu, M., & Geron, K. (2008). Changing Neighborhood: Ethnic Enclaves and the Struggle for Social Justice. Social Justice, 35(2), 18-35. Gotham, K. (2001). A City without Slums: Urban Renewal, Public Housing, and Downtown Revitalization in Kansas City, Missouri. (I. American Journal of Economics and Sociology, Ed.) American Journal of Economics and Sociology, Vol. 60(1). The Ellis Act is a California state law that allows landlords to evict tenants and terminate leases in the interest of selling the property either in full or in part. The code, Section 7060 – 7060.7, states that “No public entity, as defined in Section 811.2, shall, by statute, ordinance, or regulation, or by administrative action implementing any statute, ordinance or regulation, compel the owner of any residential real property to offer, or to continue to offer, accommodations in the property for rent or lease,” etc. Chapple, K. (2009). Mapping Susceptibility to Gentrification: The Early Warning Toolkit. The Center for Community Innovation (CCI), City and Regional Planning. UC Berkeley. O’Sullivan, A. (2009). Urban Economics (7th Edition ed.). New York, New York: McGraw-Hill/Irwin. Light, I., Sabagh, G., Bozorgmehr, M., & Der-Martirosian, C. (1994, February). Beyond the Ethnic Enclave Economy. Social Problems, 41(1 Special Issue on Immigration, Race, and Ethnicity in America), 65-80. The Federal Insurance Contributions Act (FICA) requires 6.2% and 1.45% be taxed on employee income to pay into Social Security and Medicare; eligibility for Social Security benefits upon retirement is based on previous contributions to the system. Whitman, K., Reznik, G., & Shoffner, D. (2011, November 11). Who Never Receives Social Security Benefits? Social Security Bulletin, 71. Wong, W.-h., & Liao, D. (2008). Traditions and Heritage in Tai Po. Zhou, M. (1992). Chinatown: The Socioeconomic Potential of an Urban Enclave. New York, New York: Temple University. U.S. Census. (2005-2009). American Community Survey. U.S. Census Bureau. (2008-2012). American Fact Finder, Community Facts. City and County of San Francisco. (n.d.). San Francisco General Plan. City and County of San Francisco, Planning Department. San Francisco: City and County of San Francisco.